Davidsonville, MD – Sad news out of Eco-Goats Headquarters this week. The team (human and animal) had to say premature goodbyes to snuggler-extraordinaire, Brucey Goosey. Despite his male anatomy, Bruce aspired to be a dairy goat. 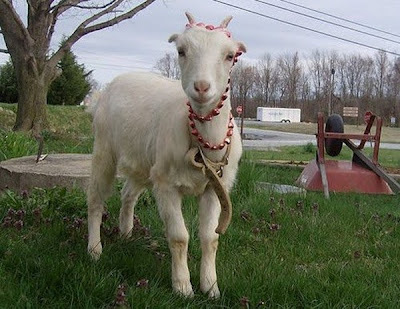 When Eco-Goats shepherds learned about Bruce’s zest for life, he was offered the spokesgoat position for the company. The cause of his unfortunately early passing is undetermined but suspected to be Coccidiosis. Bruce was laid to rest among the best. You’ll be missed, little buddy. An interesting article was published in The Baltimore Sun this morning regarding a goat turned pet in Cecil County, MD. The Balunsat couple purchased Snowbird for several hundred dollars through a newspaper advertisement and have raised her alongside several other animals since she was just a kid. Snowbird, who lives in a home with less land than zoning laws require for animal husbandry, was not the original complaint. A rooster was – and the family already got rid of it (seemingly without objections). Neither the law or the family involved are concerned with whether or not the goat (or chickens, dogs, etc) qualify or act as working animals – or about the natural needs/purposes of/for the animal in question. The idea of farm animals in urban areas has been a hot topic lately as many urban and suburban neighborhoods are circulating petitions to allow residents to keep chickens for the purpose of fresh laid eggs. University of Maryland Extension sheep and goat expert, Susan Schoenian, points out the separation human beings have had from farm animals and processes and that there is a growing movement back towards that connection. When talking goats here in Maryland, I like to point folks towards my favorite herd, the Eco-Goats, who are fighting the good fight against invasive plant species (and helping out the state’s endangered turtle). But as you all are aware, not all eco-systems are created equal and what may benefit one place could be detrimental to another. No where is this truth more visible today than on the Galapagos Islands of Espanola. There, a population of hundreds of thousands of tortoises (Geochelone hoodensis) has decreased to a few thousand as the population of goats, introduced to the islands by humans, increased exponentially. So what did scientists decide to do to save the population of tortoises to extinction? A pretty brutal goat eradication program that I’d rather not paraphrase. Read all about it here. The good news is: their efforts, that have been going on unbeknownst to me since the 1970s, appear to have been successful and the turtle population is going to be a-okay. The bad news is: their war on goats has been going on unbeknownst to me since the 1970s. All kidding aside, it sounds like a success story. One eco-systems’ trash is a blogger in Maryland’s treasure. 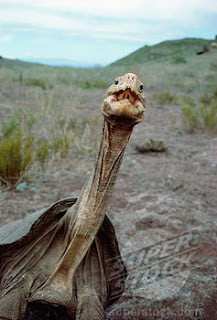 Author DeborahPosted on January 16, 2012 June 20, 2012 Categories Organic MattersTags goats, invasive species, turtlesLeave a comment on Goats vs Tortoises?